UCI engineering professor Alon Gorodetsky (left) and doctoral student Chengyi Xu (right). Photo: Steve Zylius/UCI. Materials inspired by disappearing Hollywood dinosaurs and real-life shy squid have been invented by engineers at the University of California, Irvine (UCI), according to new findings reported in a paper in Science. The thin swatches can quickly change how they reflect heat, smoothing or wrinkling their surfaces in under a second after being stretched or electrically triggered. That makes them invisible to infrared night vision tools and lets them modulate their temperatures. "Basically, we've invented a soft material that can reflect heat in similar ways to how squid skin can reflect light," explained corresponding author Alon Gorodetsky, an engineering professor. "It goes from wrinkled and dull to smooth and shiny, essentially changing the way it reflects the heat." Potential uses include as better camouflage for troops and insulation for spacecraft, as well as in storage containers, emergency shelters, clinical care, and building heating and cooling systems. "We were inspired both by science fiction and science fact – seeing dinosaurs disappear and reappear under an infrared camera in Jurassic World and seeing squid filmed underwater do similar things," said Gorodetsky. "So we decided to merge those concepts to design a really unique technology." Made of sandwiches of aluminum, plastic and sticky tape, the material transforms from a wrinkled grey to a glossy surface when it is either pulled manually or zapped with a voltage. Products that reflect heat, such as emergency blankets, have existed for decades. But in the past few years, researchers in Gorodetsky's lab and others have pushed to create dramatically improved versions via bio-inspired engineering. One focus has been to imitate how squid and other cephalopods can nearly instantaneously change their skin to blend into their surrounding environment. Now, Gorodetsky and his team have created prototypes that can next be scaled up into large sheets of commercially usable material. Patents are pending. "It was hard, especially the first phase when we were learning how to work with the sticky material," said doctoral student and lead author Chengyi Xu. 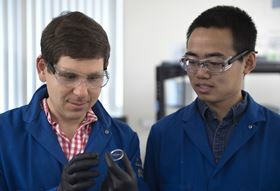 Following a trial-and-error approach involving thousands of attempts, he and postdoctoral scholar George Stiubianu finally saw the mirror-like coating change when they pulled the material sideways. "The whole project was so exciting," Xu said. Gorodetsky praised his team: "These are exactly the type of graduate students and postdocs that UCI should be recruiting. They're amazing." This story is adapted from material from the University of California, Irvine, with editorial changes made by Materials Today. The views expressed in this article do not necessarily represent those of Elsevier. Link to original source. Using embedded liquid crystals, scientists have created a shape-shifting polymer material that can morph from one sophisticated form to another.